If you feel that your kitchen needs a bit of an upgrade, sometimes the easiest and quickest way to make a huge difference to the overall effect is to simply change the backsplash or to add a new one. Natural stone tiles like “travertine tile backsplash” are a popular choice for an upgrade to normal ceramic tiles, as they are fairly hard wearing, long lasting, and very aesthetically appealing. There are many color options, a variety of finishes, and different types of stone tiles to choose from in two size options. The use of stone is perfect for any kitchen, whether you want to create a rustic more traditional look, or if you want to combine the stone with more modern materials like bright red cabinets for a contemporary feel. If you would like to create modern look you can use white marble mosaic backsplash tile. You can choose from natural, high quality stone, like Granite, Marble, Limestone, Travertine, Slate, and Onyx and each of these natural stone backsplash tile options also comes in a variety of finishes. Stone tiles come as mosaic sheets or subway tile in either 4 x 4 or 3 x 6 size, giving you the best variety. The first thing you have to do when you are planning on installing stone tiles is to check where they will go, the height of the walls, and the overall look you are trying to achieve. Aside from creating a professional, high quality backsplash for behind your sink, you can also carry the theme on around your entire kitchen also covering the back of the stove. Many people prefer to create larger backsplashes behind their stoves which provide adequate protection for the wall. When implementing the design, there are certain factors that should be considered. One of the main things to think about is how you use the space and what features you require. Some stone types absorb more moisture than others, making them less ideal for behind a sink that gets wet frequently. If you are an avid cook and enjoy spending a lot of time in your kitchen, a wider backsplash might be more suitable. If you want your kitchen to conform to the latest in design trends, you will look at the width in relation to the cabinet height, and counter tops and the rest of the design. Some designs can include a variety of colorings within the same stone tile type, if you want to create a more casual look that is interesting and funky. 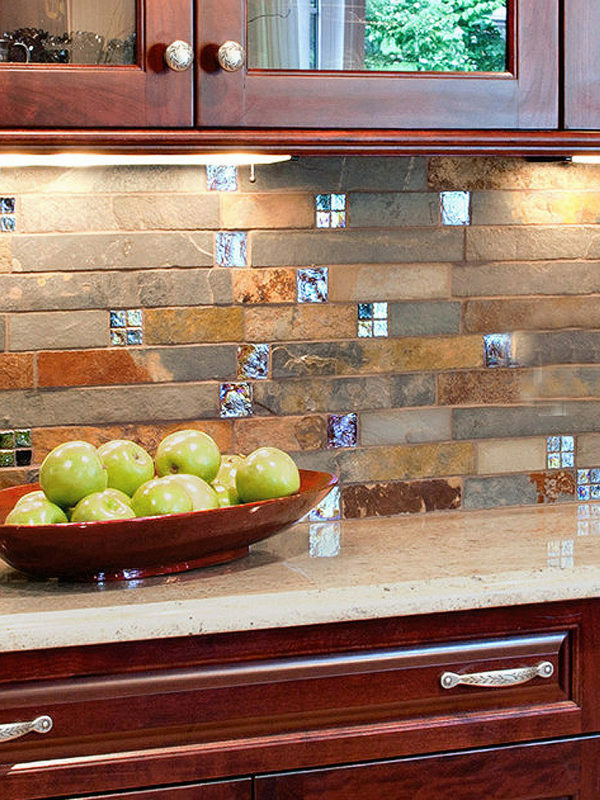 Many natural stone backsplash tiles come in a range of colors from pale white or cream to a more reddish-brown. Otherwise you can create a more uniform effect with stone that has very similar colors within a large section like marble or granite. To create uniformity you should group like colors together. There are many advantages of using natural stone as backsplash tiles. Firstly, it offers a more professional, designer look. You will also find that stone tiles are extremely versatile and durable, as long as they are looked after. They can be tumbled, which offer a smoother, more sophisticated look, matte for a more natural, rustic look, polished and brushed. These different finishes are all unique and provide you with just the right effect that you want for your kitchen. Compared to porcelain or ceramic tiles, the stone gives you a better, high end backsplash design that is suitable for any kitchen. It adds depth and character to your kitchen, and also gives you the ability to match the backsplash to your counter top, whether you use marble or granite. • Find out if the stone tiles stain easily or absorb too much moisture. • Match or contrast the color. • Think about the cleaning and maintenance required for each stone tile. • Look at the cost of each type. Depending on the type of stone tile, there are certain ways that you should keep them clean and maintain them. For instance, natural stone tiles are very susceptible to the acid in food and drink, which causes them to become dull and damaged over time. You have to make sure that you wipe the backsplash down after using it every week, whether it is grime from the stove, or merely water from the sink, and also use a special stone cleaner that removes dirt and grime on a regular basis. In addition to this, the grease from the back of the stove should be scrubbed with a hard bristle brush and more stone cleaner should be added afterwards. Different types of stone also require different care. For instance the siliceous stone should be cleaned with a mild acidic cleanser such as a diluted half cup of ammonia. When it comes to calcareous stone like marble, onyx and travertine, you should not use anything acidic to clean it with. Instead clean it with a dishwashing liquid mixture and then polish with a dry cloth afterwards. Also be aware that with all natural stone backsplash tiles, you should never use scouring powders as they will damage the stone. Instead, you should use natural products as far as possible such as diluted baking soda which will be gentle on the stone tiles. Over and above the cleaning, you will need to maintain the stone backsplash by applying a special sealer to protect the stone from the water absorbency, scratches and more. With these great natural stone backsplash tile options, you can easily transform your kitchen from dull and drab to totally fab in a very short space of time! It is easy, affordable, effective, and gives you a simple way of creating a big impact. Decorating your kitchen can be a costly affair, however, if you fix small areas bit by bit, like the backsplash, you will not only be benefiting from a new kitchen to work in, but also get to save a lot of money. This entry was posted in ANTIQUED, BEIGE, BROWN, MARBLE, TRAVERTINE, TUMBLED HONED and tagged travertine backsplash designs, travertine mosaic backsplash, travertine tile backsplash photos.